This is my review of Business Class on American Airlines Boeing 77W (777-300) between London Heathrow and New York JFK. 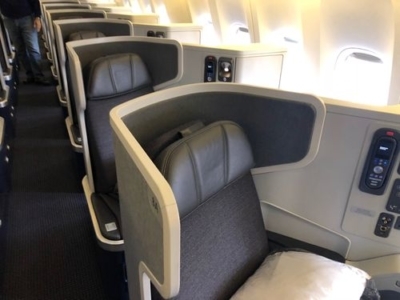 When redeeming Avios to the US, you often have the option to fly with BA’s partner American Airlines. 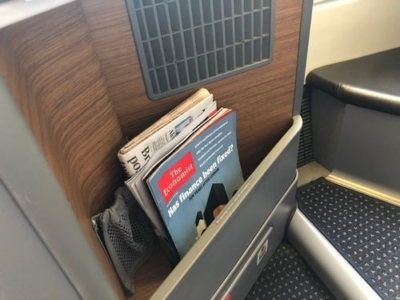 But is American Airlines business class as good as Club World? When redeeming Virgin Flying Club miles to the US, you often have the option to fly with Virgin’s partner (and 49% shareholder) Delta Air Lines. But is Delta One – the Delta business class seat – as good as Virgin Upper Class? My flight was booked with Avios via ba.com. I reviewed the American Airlines First Class lounge at London Heathrow Terminal 3 here. It isn’t great and if you’ve got any sense (and a Gold card) you’ll head for the Cathay Pacific First Class lounge instead. Business Class passengers without a Gold card are best to hit the Qantas or Cathay lounges rather than the AA or BA ones. 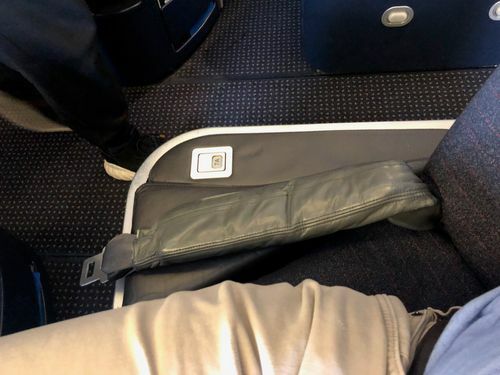 20 years ago, Business Class on US airlines was a laughing stock. 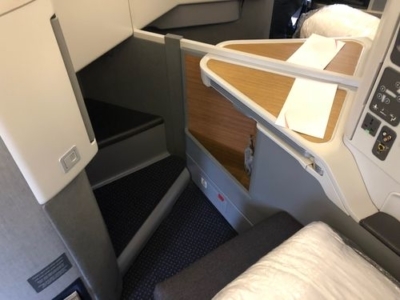 British Airways had its swanky flat beds (BA was the first airline to fly one) whilst the US airlines carried on for years with seats on a par with what Norwegian now flies as Premium. Those days are long gone on Delta and American. We are still waiting for United’s Polaris seat to arrive at Heathrow. whilst your feet disappear into a footwell, it is a big one – you can move your feet around. I should note that the footwell appeared narrower on the seats in the middle section. None of these things seem like a big deal. Individually, they’re not. However, when it all comes together, it makes you feel very calm. All of the little niggles you expect to find turn out not to exist. Nothing is perfect though …. You cannot see out of the window easily. Your head is basically in the aisle whilst your feet are by the window. 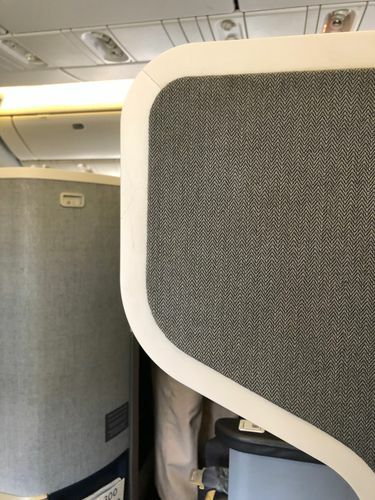 If you enjoy staring out of the window whilst flying then this may not be the seat for you. No-one explained the seat. 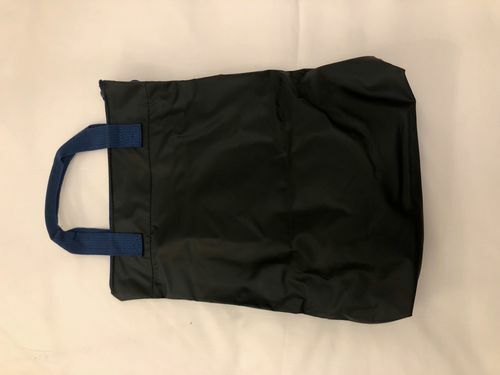 I thought there was no washbag (not all airlines offer them on day flights) but I eventually found it, with a bottle of water, just before landing in a hidden compartment. Let’s start with wi-fi. This was the best in-flight wi-fi I have ever used. It was relatively cheap ($12 for two hours) and the connection was excellent. I wasn’t doing any streaming so I can’t comment on that, but it was perfectly acceptable for email and general browsing. Sadly, the IFE system itself was a bit of a let down. American Airlines has live streaming of BBC World News and two US news channels, which was very impressive. The film selection was weak – Sherlock Gnomes and Solo were what passed as ‘new releases’. The back catalogue selection was well curated, I admit, but the TV selection was poor. The TV comedy selection, which I often go for because they are short programmes, was particularly woeful. Overall it doesn’t come close to the literally thousands of pieces of content offered by the Middle East airlines. It’s worth noting that you can connect your own device to the IFE system but it requires one of those white / red / yellow 3-part cables. I was a little frustrated. The live TV and chat functions show an airline which is trying to do things differently, but it then lets itself down with weak content. 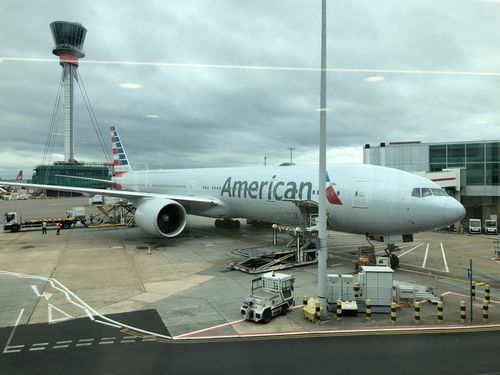 This is the end of Part 1 of my American Airlines 77W Business Class review from London Heathrow to New York JFK. In Part 2, click here, I take a look at the food on offer. If you are reading this via email, you have not been sent Part 2. Click here to read it directly on the HFP website. The toiletries brand is C.O. Bigelow, which is a quality brand and can be found at Liberty. I hadn’t realised Bigelow had become a brand. Good for them. I love their shop in The Village, especially as the Caswell Massey shop at the Waldorf closed a few years back. The store is old fashioned and charming and the prices are reasonably. I hope this doesn’t change. Having flown both BA and AA in the last 2 weeks I would disagree with the comment on the IFE. Both BA and AA had the same ‘new’ movies’ for September, while AA offered a far larger catalogue overall for both movies and tv shows (though admittedly aimed at the younger, blockbuster viewer market, with almost every Marvel Universe movie available ie, me 🙂 ). The thing that had me flummoxed the first time I flew AA Business was where to plug the headphones in! 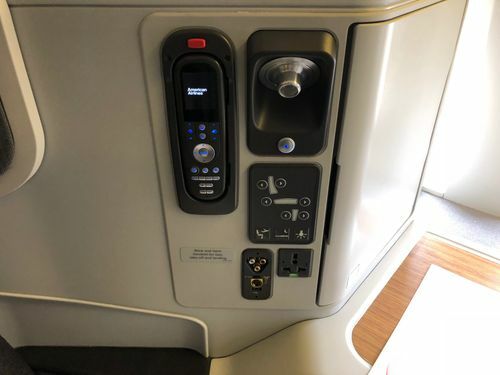 There headphones had that curious triangle arrangement of prongs that airlines go for, and right next to you – with the media controls is a triangular arrangement of sockets.. but no that’s not it (although it’s so damn closed to fitting). The socket for the headphones is _inside_ the storage cubby where the headphones are kept. You can’t see the socket whilst you’re sitting in your chair though.. but the mirror behind the cubbyhole door isn’t just for vanity.. its so, if you’re paying attention, you can see the socket holes reflected in it. I do realise they’re both excellent products, would just like to know how they stack up against each other! The 77Ws were new planes that came with this seating. The 772s are older planes that have been upgraded. 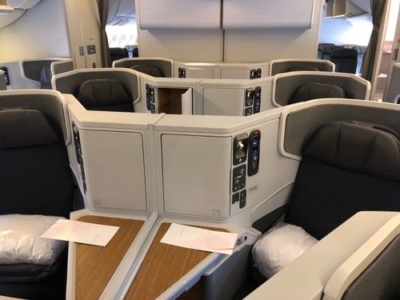 I read somewhere that there were licensing issues which stopped them using the reverse herringbone seating on the refurbished 772s. AA had supplier issues too which meant they scrapped the contract, after some planes had already been done, and moved to a different seat. It is all very messy. On our last trip to Hawaii, did 77W TATL and flew 772 to Maui. The 77W seats are much better and you have more space to put things and personally found more comfortable. The 772 have had lots of problems with the Zodiac seats (alternating front and back facing) since the fixations were not good and there are lots of reviews on which seats to chose on American forums. The problem was so big with supply and the seats, AA had to cancel the order half way from what I can gather. The seats are ok, lie flat but you do feel a little bit hemmed in when you are lying flat but choose the seats carefully since your seat could rock when the attached seat occupant moves!!! Some of the 772 are retrofitted with the B/E super diamond which are the seats to go for if you get the chance since they are similar to the 77W seats. maybe more, I’ve lost count? Can I get a referral from my partners BAPP card to a gold credit card? It only says you can refer for another BA card….but when the referral link is used the person using it can then click an option to bring up “other cards” and chose another type (e.g. the gold credit card). ‘Other cards’ seems to be only the blue free Amex and no mention of the gold card when I go via the referral link. Maybe you have adblocker on? Maybe try a different browser? I just tried it now referring from the BA card and the whole list of cards were available to choose. Yes it has finally worked. Used laptop rather than iphone and thus a different browser and seems to show all the cards now for referral. Thanks again for everyones input. AA flatters to deceive. Everyone crows: “Oh look, it’s 1-2-1” which is actually meaningless. What actually matters is the square foot per seat. So for instance JAL offers 2-3-2 on the same plane in Business and it feels better than AA. And that is before we talk about the soft service. I had to literally bed the AA hostess for more champagne. They should be pestering me! 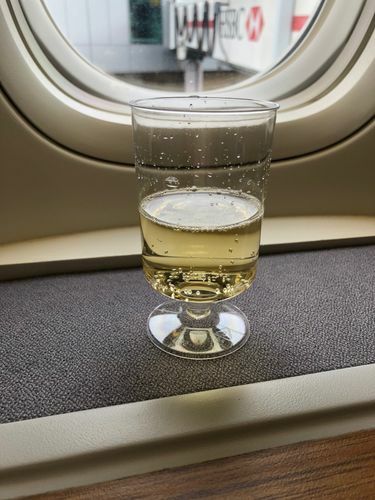 One thing you can never say about BA is that they are tight with drinks. I give AA credit for one thing though – their Flagship lounges are excellent IS you qualify for them and IF you can ever find one. Ahem. Bed the hostess for more drinks? Winner / Winner, surely? And just under your post I had a Screwfix advert! 1-2-1 on its own isn’t entirely meaningless. It means you don’t have to climb over another passenger to get out of your seat. It means half the passengers have window seats, instead of 1 in 8 on BA. Then look at the seat dimensions – 72 by 20 on BA, 75 by 20.5 on AA. 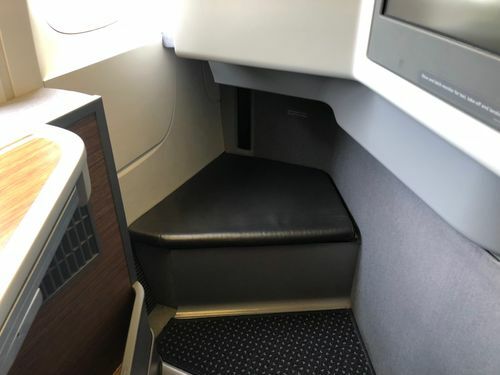 So the AA seat is 6% bigger. But the size of the seat is just a small part of the story. You get a lot of personal space around you on AA, and lots of storage space. The proof is in the second cabin on the 77W. 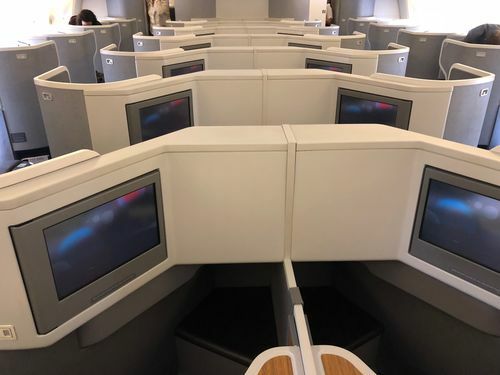 On BA, you will find 56 “Club World” seats. In 50 of those seats, you have to climb over someone to get out of your seat, or someone has to climb over you to get out of theirs. Add to that if you are travelling solo you will find yourself facing a stranger during take off and landing, and have their food passed across you during meal service. On a full flight, you may even feel you are sharing a double bed with a stranger if you in a middle pair with little privacy. And we agree, one of the things that actually matters is the square foot per seat! Yeah I know what you are saying but, even so, the “seats across” metric is overplayed. Heck even United are claiming 1-2-1 and it’s really 8-across but staggered. The best measure is to divide the square footage of the cabin by the number of seats. And yeah, the “scramble over” in BA is irksome but, as BA Gold, I get to pick my seats when I book so can avoid that. It’s not true for all seats – you have to study the plan. Anyway, I’d still rather fly BA than any US airline at this point. But BA had better not take my loyalty for granted and I am curious about the new BA CW hard product when it emerges next year. That said, can’t see them reducing density when they can fill seats like they do.